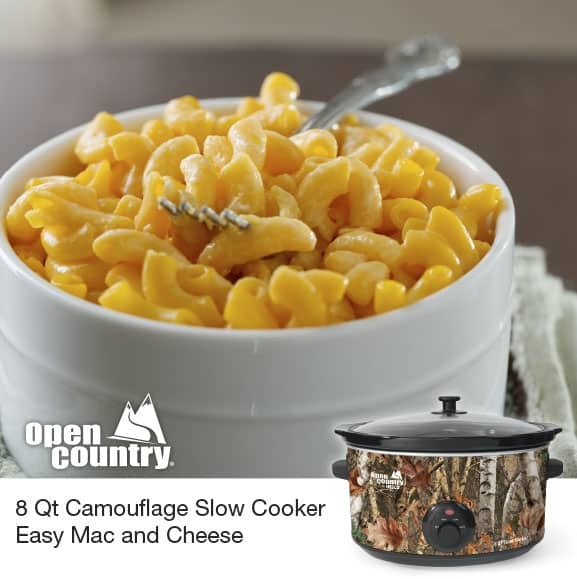 The Open Country® by NESCO® Slow Cooker is perfect for making creamy Mac and Cheese. The following recipe uses eggs and evaporated milk to make this Mac and Cheese silky and hearty. Whisk together all ingredients, except cheese and macaroni. Pour mix into a buttered Nesco® 8QT Slow Cooker cooking pot and then add cheese and macaroni. Stir to combine, cover and cook on HIGH for 30 minutes. Reduce setting to LOW and cook an additional 3 hours.